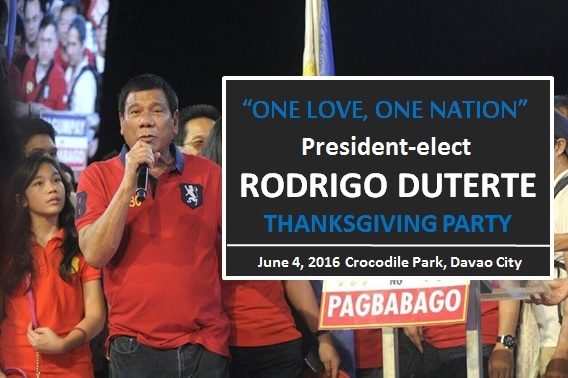 MANILA, Philippines - The “One Love, One Nation” victory and thanksgiving party of president-elect Rodrigo "Rody" Duterte is happening today, June 4, 2016 at the Crocodile Farm in Davao City. The livestream video of this event is available on this page. The organizers made it sure that the event will not only be of pure party but it has to be part public service as well to mirror the incoming president's political demeanor. The "One Love One Nation" victory party has started with medical and dental missions in Duterte's home city. At exactly 1:00 p.m., the concert ground was all set for the 500,000 expected party goers. Various artists and celebrities like It’s Showtime lead host, Vice Ganda who is known from being one of the Mayor's close friends in show business have also been invited and set to perform in front of a humongous audience. Along with the box office star are Mindanao native KZ Tandingan, comedian-rapper Andrew E, true to life couple Daniel Matsunaga and Erich Gonzales, acoustic heartthrob Jimmy Bondoc and a whole lot more. According to the organizers, all the celebrity guests will all be performing pro bono and in-support of the incoming president’s administration. The security measures have already been plotted couple of weeks ago by the Presidential Security Group (PSG) in cooperation with the Philippine National Police (PNP). There will be at least 4,000 cops who will be deployed in all corners of the venue to implement a peaceful and orderly celebration. There will be multi security inspection stations manned by the PNP. Umbrellas, backpack and hats are just some of the prohibited items and will surely be confiscated. Cartographic sketches of Philippines' most wanted criminals who are still at large have already been disseminated to the police on duty. Last night, presidential secretary and long time aide of Duterte, Mr. Bong Go, said in an ambush interview that the president-elect will no longer be having any press conferences to avoid being misquoted. Go also informed the public that Duterte will more likely use government owned TV and radio stations to cover his press briefings and other public appearances. In line with this, news broke from some netizens who are based in Davao that some media people are allegedly being prohibited to enter the event premises. True to his words, Duterte has started to use PTV 4 as the official broadcaster of his first event and the succeeding ones. On its Facebook page, PTV announced the live telecast starting 9:15 p.m. The president-elect is also trying to warn the public that he has the authority to call the shots and he’s not pushover.